Small businesses or professionals with limited needs with regards to a virtual PBX. eVoice offers limited extensions, minutes, and features. Call Queuing and Internet Faxing. More than 2 numbers are available, the lowest plan offers 2 extensions, and the highest offers 15.
eVoice is a subsidiary of J2 Global along with Onebox. They offer 3 basic plans, however their feature list may be a bit light for some business needs. You get 100 additional minutes for each extension you add. $9.95 each/month to add an extension. You can access your favorite eVoice features right from your iPhone, Android, or BlackBerry device. Manage your voice messages and make calls from any location. You can access all of the the standard voicemail management tools, as well as following features: caller id(your evoice number is displayed as the number you are calling from), voicemail to text, voicemail search, call existing contacts with your evoice number, and speed dial. 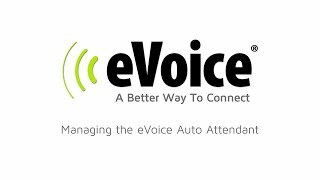 eVoice now provides 24/7 customer support based out of California and Indiana. They have also worked to improve their BBB rating to a B+. We give them kudo’s for the hard work and improvement in this area. They now have an after hours mode available via advanced call routing. They now provide local Canadian numbers as well as service in Canada. eVoice has had some poor customer reviews in the past. If you are in that mid-range area where you will use around or just under 1000 minutes a month, and don’t need features such as internet faxing, or queing then you will probably do fine with eVoice. You can now select from plans on the low end with only 300 minutes/2 extensions, to their top plan with 1000 minutes/5 extensions. Impossible to get them on the phone. Wait times of up to 2 hours common. Call center in india can’t understand them. I called today and they told me to call back on Monday !? Also many times the phone lines don’t work people call and get a busy signal. Do not depend on Evoice if you run a business. BEWARE!!!! Evoice has been scamming us!!! They charged us for over two years after cancelling!!! You cant cancel service online, and they don’t respond to billing enquiries by email (no written records, only by phone = scam.) We contested. They hang up on us. To be clear, and if in doubt, that service was NEVER USED. They knew it, but still did not want to reverse the charges. I wonder how many people got scammed. Would give 0 stars. You have to call them up to cancel the account. Unbelievable. And guess what? They don’t even answer! – Requested closure via their phone number. Their representative put me on hold for 10 min and then told me that my US number is not a US number.